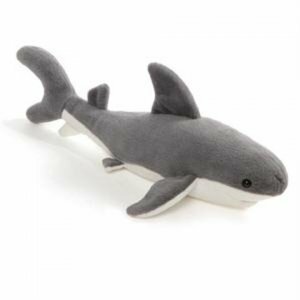 21"/53.5cm, Gray and whitelow nap polyester plush shark with some plastic pellets in the belly, an extra soft squishable body, flexible, non stuffed fins. A friendly shark with a large smile (no teeth to bite with), accurate details to please any shark lover. Non jointed, hand wash, mild suds, air dry, ages 1+.